It’s the trend of these last two years to slap a “3D” on everything and double the price. We now have 3D movies that no one ever asked for and that force you to do unnatural things with your eyes. We have 3D televisions just to watch those movies. And we have Blokus 3D. Does Blokus 3D use the same strategy just to increase the price? Not really, the 3D here is not a tacked on gimmick, it’s at the center of the game. On the other hand, the name Blokus was been added to the game only in later editions. Originally, Blokus 3D was sold as Rumis, but it had enough in common with the Blokus games to be included in the series. Like Blokus, Blokus 3D is played on a grid by placing pieces that may or may not remind you of Tetris until they don’t fit any more. But instead of tiles you are now dealing with blocks. Most of them are still basically in two dimensions, only they are composed of cubes instead of squares, but some pieces make real use of the third dimension as well. The game board did not survive the transition to three dimensions unchanged either: it starts out looking the same, but before the game starts you chose a blueprint to build upon. The blueprint tells you what shape you can build on the board, defining the outline and the height. No piece can ever be placed outside this volume. Our editions includes four different blueprints: the Tower, the Wall, the Stairs and the Pyramid. The height to which you can build is different based on the number of players so there’s never too much space to build in. The rules for Blokus 3D are even quicker to explain than for the original Blokus. The first player places one of his tiles. All the other player place one of theirs in a way that one face of a cube touches one face of a cube already on the board. From the second piece on, pieces must be placed to touch one of the player’s own blocks already in play. When you cannot do that, you’re out. The only restriction beyond that is that you can not create tunnels: everything needs to touch the game board or another piece under it. The big difference from other Blokus games is the scoring. Left-over blocks still cost you points, but only one per block, not one per cube like in Blokus. 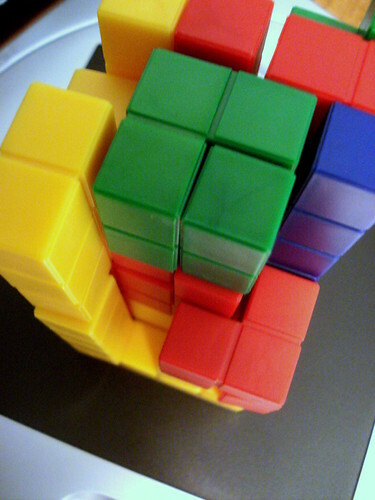 The main part of your score, however, is from visibility: Every cube of your color that is visible from the top in the final “building” is worth one point, so your primary goal should be to get to the top on the back of other people’s – I hadn’t realized, but turns out that Blokus 3D is a metaphor for most modern companies. Blokus 3D doesn’t play like Blokus. That doesn’t matter so much, the important question is: does it play well? If you’re not expecting Blokus it does indeed. I was disappointed at first because this game lacks the mercyless interaction of Blokus. I started enjoying it a whole lot more when I abandoned the thought that I was playing Blokus here. Blokus 3D is not an area control game, locking an opponent out is not possible in many cases – and not the way to win, either: points are awarded for being visible from the top at the end, it’s more profitable to force your opponent to play on the ground so you can place your pieces on top of his instead of building your own foundation. The game is played with only eleven pieces per player on a small board and you generally have much less options than you would have in a Blokus game. Consequently, Blokus 3D plays very quickly – the 20 minutes the box states are a pretty accurate measure. The strategic depth suffers a little from that, your options are more limited than they are in Blokus. However, Blokus 3D is still a purely strategic game, there is not one bit of luck involved and it does offer ample mental stimulation. So get your mind out of Blokus mode for a little while – Blokus 3D is more than Blokus with an expensive suffix, it’s a good game in its own right.